Robocop (2014) Blu-ray review | What Hi-Fi? Remaking or ‘rebooting’ a cult classic tends to lead to no end of trouble. Thankfully, RoboCop isn’t the train wreck it could so easily have been. That’s not to say it’s a patch on the original. Let’s get something straight: this is inferior in nearly every way. But it does have some merits, and doesn’t deserve to be dismissed too quickly. The premise is mostly the same. A policeman (‘Cop’) is severely injured in the line of duty, and then made into a machine (‘Robo’) by an evil organisation. It’s a chance to bash the corporate world. In 1987, it was done with panache: lashings of biting satire on top of the so-nasty-it’s-funny sort of childish ultraviolence. That’s largely been replaced with a straight-up political angle. Hey, drones are topical, let’s mention those! Without the humour, it’s less effective. Where this version succeeds is in its boldness. It doesn’t slavishly repeat the original. There are a few references for the scrutinising fans, but for better or worse this mostly charts its own course. Alex Murphy is no longer a machine slowly regaining his humanity: he is now man coping with robotic bits. This allows for elements of body horror, which are effective. It also raises questions about the ethics of man-machine integration. Sadly, that’s all undermined by one-dimensional characters with very little to do. Grieving wife, check. Leather-clad mobsters, check. At least Gary Oldman has a decent role as a conflicted scientist reluctantly following corporate bosses, while Samuel L Jackson is shoutier than ever as a militant TV show host. It doesn’t help that the action is uninspired. RoboCop never does anything particularly smart or cool. Instead, the film periodically becomes a bland videogame with an uncharismatic Iron Man clone. Thankfully, it sounds thrilling. 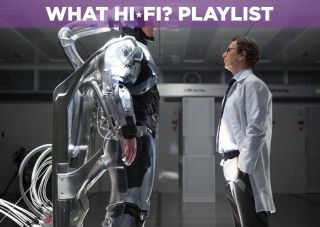 Robocop’s mechanical footsteps are wonderfully bass-heavy, and bound to annoy your neighbours in DTS HD Master Audio 5.1. The Zimmer-lite soundtrack is easily forgotten, but it does have a pounding enthusiasm – and Basil Poledouris’s original main theme is kept intact. It looks good too, with a surprising amount of colour in what could have been very grey. Ultimately, this RoboCop is occasionally fun (if rarely memorable) as long as you approach it with an open mind. It’s certainly a lot more enjoyable than RoboCop 2 or 3. We wouldn’t buy that for a dollar – but we might stream it on Netflix.